Hillary Clinton The 2020 Democratic Party presidential primaries and caucuses will be a series of electoral contests organized by the Democratic Party to select the 4,051 delegates to the Democratic National Convention and determine the Democratic nominee for President of the United States in the 2020 U.S. presidential election. The elections will take place within all fifty U.S. states, the District of Columbia, and five U.S. territories. An extra 716 unpledged delegates (712 votes) or superdelegates, including party leaders and elected officials, will be appointed by the party leadership independently of the primary's electoral process. The convention will also approve the party's platform and vice-presidential nominee. The 2020 Democratic Party presidential primaries and caucuses will be a series of electoral contests organized by the Democratic Party to select the 4,051 delegates to the Democratic National Convention and determine the Democratic nominee for President of the United States in the 2020 U.S. presidential election. The elections will take place within all fifty U.S. states, the District of Columbia, and five U.S. territories. An extra 716 unpledged delegates (712 votes) or superdelegates, including party leaders and elected officials, will be appointed by the party leadership independently of the primary's electoral process. The convention will also approve the party's platform and vice-presidential nominee. Following the 2016 presidential elections, significant changes were proposed that would change the number and role of superdelegates in the nomination process. Changes were enacted on August 25, 2018, which would allow superdelegates to vote on the first ballot at a convention only if it were uncontested. After Hillary Clinton's loss in the previous election, the Democratic Party was seen as not having a clear leader. There remained divisions in the party following the 2016 primaries which pitted Clinton against Bernie Sanders. Between the 2016 election and the 2018 midterm elections, Senate Democrats have generally shifted to the political left in relation to college tuition, healthcare, and immigration. Soon after the 2016 general election, the division between Clinton and Sanders supporters was highlighted in the 2017 Democratic National Committee chairmanship election between Tom Perez and Keith Ellison. Perez was elected Chairman and appointed Ellison as the Deputy Chair, a largely ceremonial role. Several candidates began releasing serious policy proposals early in 2019 resulting in the "invisible primary" becoming more visible than in previous elections. Perez has commented that the 2020 primary field will likely go into double-digits, rivaling the size of the 2016 GOP primary, which consisted of 17 major candidates. In response to criticism of their 2016 debate schedule, the DNC has planned for at least twelve televised debates (the first six taking place in 2019). Depending on the size of the primary field, Perez has floated the possibility of splitting a single debate between two nights at the same location, choosing the participants of each night publicly and at random. Additionally, instead of polling numbers being the sole margin of participating in a debate, grassroots fundraising amounts will also factor into a candidate's inclusion. Reflecting growing changes to the demographics of the elected Democratic officials, several female candidates are expected to enter the race, increasing the likelihood of the Democrats nominating a woman for the second time in a row. The topic of age has been raised in regards to some of the most likely front-runners: Joe Biden, Elizabeth Warren, Bernie Sanders; who will be 78, 71, and 79 respectively on Inauguration Day. Former Democratic Senate Leader Harry Reid described the trio as "an old folks' home", expressing a need for younger, lesser known faces to step up and lead the party. In addition to having announced that they are running for president in 2020 or having formed exploratory committees for the 2020 presidential election, the candidates in this section have held public office or have been included in a minimum of five independent national polls. The candidates in this section have withdrawn or suspended their campaigns. Individuals in this section have expressed an interest in running for president within the last six months. Some already have leadership PACs that function as campaign committees. Steve Bullock, Governor of Montana since 2013. Eric Holder, U.S. Attorney General 2009–2015; Acting U.S. Attorney General in 2001 from Washington, D.C.
On December 20, 2018, Tom Perez, the chairman for the Democratic National Committee, announced the preliminary schedule for a series of official debates, set to begin in June 2019. Qualifications were announced on February 14, 2019, which included reaching one percent support in three reputable polls or by meeting a fundraising threshold, in which a candidate must receive donations from 65,000 unique donors, with at least 200 unique donors per state in a minimum of 20 states. John Delaney was the first major candidate to announce his campaign, two and a half years before the 2020 Iowa caucus. July 28: Representative John Delaney of Maryland announces his candidacy in an op-ed in The Washington Post. Julian Castro's formation of an exploratory committee in December 2018 was seen as the start of the campaign in earnest. August 25: Democratic Party officials and television networks begin discussions as to the nature and scheduling of the following year's debates and the nomination process. Changes were made to the role of superdelegates, deciding to only allow them to vote on the first ballot if the nomination is uncontested. November 6: The 2018 midterm elections are held. November 11: West Virginia State Senator Richard Ojeda announces his candidacy. November 19: Ojeda holds a campaign launch rally in Louisville, Kentucky. December 12: Former Secretary of Housing and Urban Development Julian Castro forms an exploratory committee. December 31: Senator Elizabeth Warren of Massachusetts forms an exploratory committee. Sen. Kamala Harris launched her bid on January 21, 2019. Bernie Sanders (pictured here in 2016) launched his second campaign on February 19, 2019. January 11: Representative Tulsi Gabbard of Hawaii announces her candidacy during an interview on The Van Jones Show. January 12: Castro announces his candidacy at a rally in San Antonio, Texas. January 15: Senator Kirsten Gillibrand of New York forms an exploratory committee. January 21: Senator Kamala Harris of California announces her candidacy during an interview on Good Morning America. January 23: Mayor Pete Buttigieg of South Bend, Indiana forms an exploratory committee. January 26: Ojeda drops out of the race. January 27: Harris holds a campaign launch rally in Oakland, California. February 1: Senator Cory Booker of New Jersey announces his candidacy via a YouTube video. February 2: Gabbard holds a campaign launch rally in Honolulu, Hawaii. February 9: Warren announces her candidacy at a rally in Lawrence, Massachusetts. February 10: Senator Amy Klobuchar of Minnesota announces her candidacy at a rally in Minneapolis, Minnesota. February 19: Senator Bernie Sanders of Vermont announces his candidacy via an email to supporters and appears on Vermont Public Radio as well as CBS This Morning as part of his campaign launch. Starting in June, a series of forums and debates are expected to take place. The following anticipated primary and caucus dates may change depending on legislation passed before the scheduled primary dates. As of February 2019[update], primaries and caucuses for the following states are not yet scheduled; 2016 dates are listed in parentheses: American Samoa (March 1), Kansas (March 5), Maine (March 6), Northern Mariana Islands (March 12), Alaska, Hawaii, Washington (March 26), Wyoming (April 9), Guam (May 7), Virgin Islands (June 4), and North Dakota (June 7) caucuses and Democrats Abroad, Georgia (March 1), Nebraska (March 5), Idaho (March 22), and New York (April 19) primaries; Utah (March 22) has a presidential caucus, but a primary option if funded; New York primary is scheduled for February 4 for procedural reasons, but date is expected to be amended. The 2020 Democratic National Convention is scheduled for July 13–16, 2020. On June 20, 2018, the DNC announced four finalist bidders under consideration for the convention site: Houston, Texas, Miami Beach, Florida, (hosted the 1972 convention), Milwaukee, Wisconsin, and Denver, Colorado. Denver was immediately withdrawn from consideration by representatives for the city, citing scheduling conflicts. Ben Cohen, co-founder of Ben and Jerry's. 1 2 3 This individual is not a member of the Democratic Party, but has been the subject of speculation or expressed interest in running under this party. ↑ Schultz is considering running for president as an independent candidate. 1 2 "DNC advances changes to presidential nominating process". USA TODAY. Retrieved August 11, 2018. ↑ Siders, David; Korecki, Natasha (August 25, 2018). "Democrats strip superdelegates of power in picking presidential nominee". Politico. Retrieved August 25, 2018. ↑ Easley, Jonathan (March 31, 2017). "For Democrats, no clear leader". The Hill. Retrieved January 28, 2018. ↑ Vyse, Graham (April 28, 2017). "The 2020 Democratic primary is going to be the all-out brawl the party needs". The New Republic. Retrieved January 28, 2018. ↑ Edsall, Thomas B. (September 7, 2017). "The Struggle Between Clinton and Sanders Is Not Over". The New York Times. Retrieved March 25, 2018. 1 2 Schor, Elana (December 30, 2017). "Dem senators fight to out-liberal one another ahead of 2020". Politico. Retrieved January 23, 2018. 1 2 Miller, Ryan W. (June 29, 2018). "New York's Kirsten Gillibrand, Bill de Blasio echo progressive calls to 'abolish ICE'". USA Today. Retrieved July 4, 2018. ↑ Abramson, Jill; Aronoff, Kate; Camacho, Daniel José (February 27, 2017). "After the divisive Democratic National Committee chair election, what's next?". The Guardian. Retrieved March 23, 2018. ↑ Janssen, Kim (October 26, 2017). "DNC chair Tom Perez: Expect a 'double-digit' field in 2020 presidential primary". Chicago Tribune. Retrieved January 28, 2018. ↑ Lerer, Lisa (December 20, 2018). "Democrats Plan a Dozen Primary Debates for 2020 Candidates". The New York Times. Retrieved December 23, 2018. ↑ Scher, Bill (November 24, 2017). "Why 2020 Will Be the Year of the Woman". Politico. Retrieved June 23, 2018. ↑ Zengerle, Jason (December 27, 2016). "Who Will Do What Harry Reid Did Now That Harry Reid Is Gone?". New York. Retrieved January 28, 2018. 1 2 Korecki, Natasha (February 1, 2019). "Cory Booker launches bid for president". Politico. Retrieved February 1, 2019. 1 2 Verhovek, John (January 23, 2019). "South Bend Mayor Pete Buttigieg launches presidential exploratory committee, could be nation's first openly gay nominee". ABC News. Retrieved January 23, 2019. ↑ J. Weber, Paul (January 12, 2019). "Former Obama housing chief Julian Castro joins 2020 campaign". Associated Press. Retrieved January 12, 2019. 1 2 Delaney, John (July 28, 2017). "John Delaney: Why I'm running for president". The Washington Post. Retrieved July 28, 2017. ↑ Kelly, Caroline (January 12, 2019). "Tulsi Gabbard says she will run for president in 2020". CNN. Retrieved January 11, 2019. ↑ Strauss, Daniel. "Tulsi Gabbard to run for president". POLITICO. ↑ Block, Valerie (January 15, 2019). "Kirsten Gillibrand: 'I'm going to run' for president in 2020". CNBC. 1 2 Kelsey, Adam (January 21, 2019). "Sen. Kamala Harris announces she will run for president in 2020". ABC News. 1 2 Golshan, Tara. "Sen. Amy Klobuchar has won every one of her elections by huge margins. Now she's running for president". Vox. ↑ News, V. P. R. "He's In For 2020: Bernie Sanders Is Running For President Again". Vermont Public Radio. Retrieved February 19, 2019. ↑ McCarthy, Tom (February 9, 2019). "Senator Elizabeth Warren officially launches 2020 presidential campaign". The Guardian. Retrieved February 9, 2019. ↑ "Candidates". Federal Election Commission. ↑ Braun, Dorothy L. (December 7, 2017). "BraunforPresident.US 2020" (PDF). Federal Election Commission. ↑ Nwadike, Kenneth E. (October 18, 2017). "FEC FORM 2" (PDF). Federal Election Commission. Retrieved July 31, 2018. ↑ "Indian Executive Satish Reddy Joins Team of 2020 U.S. Presidential Hopeful Robby Wells". India-West. August 3, 2017. Retrieved December 13, 2018. ↑ @marwilliamson (November 15, 2018). "Marianne Williamson on Twitter: "Announcing the formation of an exploratory committee for a presidential run in 2020. From my heart to yours... t.co/bt1ygPQr6x"" (Tweet) – via Twitter. ↑ Warrell, Margie (January 29, 2019). "Marianne Williamson: Can A Presidential Bid Fueled By Love Transcend The Politics Of Fear?". Forbes. Retrieved January 28, 2019. ↑ Roose, Kevin (January 10, 2018). "His 2020 Campaign Message: The Robots Are Coming". The New York Times. Retrieved January 26, 2018. ↑ Grim, Ryan (November 11, 2018). "RICHARD OJEDA, WEST VIRGINIA LAWMAKER WHO BACKED TEACHERS STRIKES, WILL RUN FOR PRESIDENT". The Intercept. Retrieved December 17, 2018. ↑ Grim, Ryan (January 25, 2019). "Richard Ojeda Drops Out of Presidential Race". The Intercept. Retrieved January 25, 2019. ↑ "Types of nonconnected PACs". FEC.gov. Retrieved January 2, 2019. ↑ Stan, Adele M. (November 21, 2018). "Stacey Abrams Could Be Dems' Best Hope for Winning in 2020". The American Prospect. Retrieved December 28, 2018. ↑ "Stacey Abrams Vs. Donald Trump in 2020? Georgia Governor candidate says 'I Am Open to All Options'". Newsweek. December 4, 2018. Retrieved December 28, 2018. 1 2 Caputo, Marc; Strauss, Daniel (January 16, 2019). "Abrams and Gillum are likely 2020 kingmakers". Politico. Retrieved January 16, 2019. ↑ Prakash, Nidhi (February 7, 2019). "Stacey Abrams Says She's "Thinking About Everything" For 2020". Buzzfeed News. ↑ Smith, David (February 9, 2019). "Stacey Abrams on the ticket? Democrat's star turn fuels talk for 2020". The Guardian. Retrieved February 9, 2019. ↑ "Sen. Michael Bennet Isn't Ruling Out Run For President In 2020". CBS Denver. November 30, 2018. Retrieved December 26, 2018. ↑ Birkeland, Bente (December 3, 2018). "Sen. Michael Bennet 'Seriously Thinking' About A 2020 Run For President". Colorado Public Radio. Retrieved December 26, 2018. ↑ "Colorado Sen. Michael Bennet says he is considering a run for Democratic presidential nomination". news.yahoo.com. December 19, 2018. Retrieved January 22, 2019. ↑ Costa, Robert (February 10, 2019). "Colorado Sen. Bennet hints about joining crowded Democratic race for president". The Washington Post. Retrieved February 10, 2019. ↑ Beaumont, Thomas (February 14, 2019). "Colorado Democratic Sen. Bennet set to visit Iowa this month". Associated Press. ↑ Caputo, Marc (January 28, 2019). "Biden says he'll make 'the decision soon'". Politico. Retrieved January 29, 2019. ↑ Dovere, Edward-Isaac (February 4, 2019). "Biden's Anguished Search for a Path to Victory". The Atlantic. Retrieved February 4, 2019. ↑ Viser, Matt; Scherer, Michael (February 14, 2019). "Joe Biden's 2020 campaign decision: Quietly agonizing as months go by". The Washington Post. Retrieved February 14, 2019. ↑ Parnes, Amie (February 14, 2019). "Exclusive: Biden almost certain to enter 2020 race". The Hill. 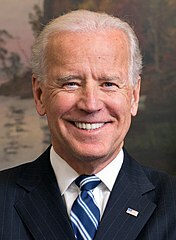 ↑ "Joe Biden says will decide soon whether to run for presidency". Reuters. February 16, 2019. ↑ Siders, David (August 28, 2018). "Bloomberg to headline Pennsylvania Democratic fundraiser". Politico. Retrieved August 30, 2018. ↑ Peoples, Steve (November 13, 2018). "Only on AP: Bloomberg charts aggressive timeline on 2020 bid". Associated Press. Retrieved November 23, 2018. ↑ Schwartz, Brian. "Mike Bloomberg prepared to spend at least $100 million on a 2020 campaign for president if he decides to run". CNBC. Retrieved December 28, 2018. ↑ Chason, Rachel (January 22, 2019). "'You can't be an absolutist': Weighing a 2020 run, Bloomberg talks compromise". The Washington Post. ↑ "Bloomberg won't decide on 2020 until March at the earliest". CNN. Retrieved February 15, 2019. ↑ Wehrman, Jessica (November 12, 2018). "Sherrod Brown for president? He's thinking about it". The Columbus Dispatch. ↑ Schor, Elana (November 23, 2018). "Sherrod Brown sets his sights on Trump in 2020". Politico. Retrieved November 23, 2018. ↑ Debenedetti, Gabriel (December 9, 2018). "Sherrod Brown Has a Blueprint for America 2020". New York. ↑ Taylor, Jessica; Seipel, Arnie (January 16, 2019). "Ohio Sen. Sherrod Brown Moves Closer To Joining 2020 Campaign". NPR. ↑ L. Price, Michelle (February 23, 2019). "Brown pledges to be most pro-union 2020 candidate if he runs". Associated Press. Retrieved February 24, 2019. ↑ "Steve Bullock plans fifth trip to Iowa in possible presidential bid". Des Moines Register. ↑ Thompson, Alex. "The 2020 Democrat with a full-fledged Republican fan club". POLITICO. ↑ Goodman, J. David (January 27, 2019). "Bill de Blasio May Be Running for President, if Only People Would Listen". The New York Times. Retrieved January 27, 2019. ↑ Walker, Hunter (February 8, 2019). "New York City Mayor Bill de Blasio flirting with a 2020 bid". Yahoo! News. Retrieved February 9, 2019. ↑ Sally Goldenberg (February 11, 2019). "De Blasio heads to New Hampshire as he contemplates run for president". Politico. Retrieved February 11, 2019. ↑ Dovere, Edward-Isaac (February 26, 2019). "Bill de Blasio Can't Resist Meddling in Iowa". The Atlantic. Retrieved February 26, 2019. ↑ Trygstad, Kyle (September 18, 2018). "John Hickenlooper Is the Antithesis of Trump—And Might Run Against Him in 2020". The Atlantic. Retrieved September 18, 2018. ↑ Kulwin, Noah (October 15, 2018). "Eric Holder talks Rod Rosenstein, His Work with Uber and Airbnb, and His Record Prosecuting Bankers". New York. Retrieved January 12, 2018. ↑ Taylor, Jessica; Johnson, Carrie (February 12, 2019). "Former Attorney General Eric Holder Close To 2020 Decision As He Heads To Iowa". NPR. Retrieved February 13, 2019. ↑ Dovere, Edward-Isaac (January 2, 2019). "Jay Inslee Is Betting He Can Win the Presidency on Climate Change". The Atlantic. Retrieved January 2, 2019. ↑ Balz, Dan (February 24, 2019). "Jay Inslee hopes a singular focus on climate will get him to the White House". The Washington Post. Retrieved February 24, 2019. ↑ Beaumont, Thomas (September 19, 2018). "Former Virginia Gov. McAuliffe Says He's Not Ruling Out 2020 Campaign". NBC 4. Retrieved October 28, 2018. ↑ Burke, Michael (December 30, 2018). "McAuliffe 'obviously looking' at 2020 run". The Hill. Retrieved December 30, 2018. ↑ McCarthy, Tom (December 31, 2018). "Terry McAuliffe turned a red state blue – but is he the face of the future for Democrats?". The Guardian. Retrieved January 2, 2019. ↑ Bedard, Paul (January 24, 2019) "Terry McAuliffe hints, ‘I'm going to announce,’ says Trump ‘has no moral core’ ", The Washington Examiner. Retrieved January 25, 2019. ↑ Seitz-Wald, Alex (September 18, 2018). "Eyeing 2020, Jeff Merkley hires up in Iowa and New Hampshire". NBC News. Retrieved November 29, 2018. ↑ Miller, Avery; Klein, Rick (December 19, 2018). "Sen. Jeff Merkley: Family on board for a 2020 presidential run and he won't defer to Sen. Bernie Sanders". ABC News. Retrieved December 20, 2018. ↑ Smiley, David (January 31, 2019). "Can anyone be president in 2020? This South Florida mayor may run and find out". Miami Herald. Retrieved February 9, 2019. ↑ Smiley, David (February 1, 2019). "About 2020 run, Messam says 'all options will remain on the table'". Miami Herald. Retrieved February 9, 2019. ↑ Brooks, Ryan (February 13, 2019). "A Florida Mayor Is Thinking About Running For President And It's Not Andrew Gillum". BuzzFeed News. Retrieved February 13, 2019. ↑ Villa, Lissandra (February 11, 2019). "Rep. Seth Moulton Is Thinking About Running For President". BuzzFeed News. Retrieved February 11, 2019. ↑ Mary Markos (February 11, 2019). "Seth Moulton considering 2020 White House run". Boston Herald. Retrieved February 14, 2019. ↑ Diaz, Kevin (November 7, 2018). "What's next for Beto O'Rourke? Presidential speculation, of course". Houston Chronicle. Retrieved November 26, 2018. ↑ Siders, David (January 25, 2019). "Beto O'Rourke says 2020 decision could be months away". Politico. Retrieved January 25, 2019. ↑ Epstein, Reid J. (January 30, 2019). "Beto O'Rourke Weighs Presidential Campaign From an Unusual Position: Front Runner". Wall Street Journal. Retrieved January 30, 2019. ↑ Siders, David (February 15, 2019). "Beto O'Rourke in talks with strategists ahead of likely 2020 bid". Politico. Retrieved February 15, 2019. ↑ O'Reilly, Andrew (February 6, 2019). "Rep. Tim Ryan, who once challenged Pelosi, mulling 2020 presidential bid". Fox News. Retrieved February 6, 2019. ↑ Gomez, Henry J. (February 8, 2019). "Rep. Tim Ryan Is Heading To Iowa And New Hampshire As He Considers Running For President". BuzzFeed News. Retrieved February 9, 2019. ↑ Axelrod, Tal (December 12, 2018). "Swalwell: I 'do see a path' to 2020 Democratic nomination". The Hill. Retrieved December 26, 2018. ↑ Carla Marinucci and Natasha Korecki (February 12, 2019). "Eric Swalwell leans on Iowa as he eyes 2020 bid". Politico. Retrieved February 14, 2019. ↑ "Swalwell On Potential 2020 Run: 'I'm Ready To Do This'". KPIX-TV. February 13, 2019. Retrieved February 14, 2019. ↑ Mangan, Dan (December 4, 2018). "Michael Avenatti announces he will not run for president in 2020". CNBC. Retrieved December 4, 2018. ↑ Astor, Maggie; Flegenheimer, Matt (December 4, 2018). "Michael Avenatti, After Flirting With Run, Says He Won't Seek White House". The New York Times. Retrieved December 4, 2018. ↑ Richards, Sam (March 30, 2017). "Jerry Brown for president? 'Don't rule it out!'". Contra Costa Times. Retrieved May 10, 2017. ↑ Steinmetz, Katy (September 9, 2017). "The Philosopher King". Time. Retrieved November 7, 2017. ↑ Laura Olson (November 26, 2018). "Bob Casey stokes speculation for a presidential run in 2020". The Morning Call. Retrieved January 26, 2019. ↑ "Casey Ends Consideration of a Presidential Run in 2020". U.S. News & World Report. January 18, 2019. Retrieved January 18, 2019. ↑ Seitz-Wald, Alex. "Hillary Clinton runs to Puerto Rico, not the White House". NBC News. NBC News. Retrieved January 29, 2019. ↑ Dovere, Edward-Isaac (July 18, 2017). "Can Roy Cooper Show Democrats How to Win Again?". Politico. Retrieved August 28, 2017. ↑ Moody, Aaron; Specht, Paul A. (March 29, 2018). "Roy Cooper for president? 'I'm sure I'll get some calls.'". The News & Observer. Retrieved July 5, 2018. ↑ Spector, Joseph (November 21, 2017). "Cuomo 2020? Four things to watch". The Journal News. Retrieved November 21, 2017. ↑ Klepper, David (January 4, 2018). "New York governor's DC attacks prompt 2020 speculation". The Seattle Times. Retrieved January 5, 2018. ↑ Donato, Christopher (August 29, 2018). "Andrew Cuomo says he won't run for president in 2020 during New York Governor's debate with Cynthia Nixon". ABC News. Retrieved August 30, 2018. ↑ Zanotti, Emily (September 4, 2018). "RAHM FOR PREZ? Chicago Mayor Announces He WON'T Run For Re-Election". The Daily Wire. Retrieved September 5, 2018. ↑ Fearnow, Benjamin (September 4, 2018). "Why Isn't Rahm Emanuel Running for Chicago Mayor Again?". Newsweek. Retrieved September 5, 2018. ↑ Montellaro, Zach (November 30, 2018). "Mayor Rahm's 2020 strategy for Democrats". Politico. ↑ Parnes, Amie; Henry, Devin (August 25, 2017). "Franken seen as reluctant 2020 candidate". The Hill. Retrieved August 26, 2017. ↑ Pfeiffer, Alex (November 16, 2017). "Does Al Franken Still Have A Shot In 2020?". The Daily Caller. Retrieved November 22, 2017. ↑ Molloy, Tim (November 29, 2016). "Sen. Al Franken Won't Run for President in 2020 (Exclusive)". TheWrap. ↑ Siders, David; Cadelago, Christopher; Strauss, Daniel. "Los Angeles Mayor Eric Garcetti will not run for president". POLITICO. Retrieved January 29, 2019. ↑ "Andrew Gillum Meets With Obama Amid Speculation of 2020 Bid". Newsmax. December 5, 2018. ↑ Buck, Rebecca (December 5, 2018). "Florida Democrat Andrew Gillum meets with Obama amid 2020 speculation". CNN. Retrieved December 5, 2018. ↑ Mindock, Clark (July 20, 2017). "Al Gore's new climate change film raises huge question: Will he run again in 2020?". The Independent. Retrieved July 25, 2017. ↑ "Here's why Al Gore is done with politics". NowThis News. August 2, 2017. Retrieved August 4, 2017. ↑ Korecki, Natasha (November 29, 2017). "Gutiérrez eyes 2020 presidential run". Politico. Retrieved November 30, 2017. ↑ Preston, Mark (May 10, 2018). "Rep. Gutierrez passes on presidential bid, will focus on mobilizing Latino voters". CNN. Retrieved May 15, 2018. ↑ AM, Harriet Sinclair On 7/12/18 at 4:05 (2018-07-12). "Dwayne "The Rock" Johnson is "absolutely" thinking about running for president". Newsweek. Retrieved 2019-02-22. ↑ CNN, Saba Hamedy. "'The Rock' is not running for president in 2020". CNN. Retrieved 2019-02-22. ↑ Rozsa, Matthew (November 16, 2017). "Tim Kaine wants to eliminate superdelegates". Salon. Retrieved December 4, 2017. ↑ Hagen, Lisa (November 17, 2016). "Kaine rules out run for president in 2020". The Hill. Retrieved November 17, 2016. ↑ Caygle, Heather (September 3, 2017). "The next Kennedy weighs his next move". Politico. Retrieved December 14, 2017. ↑ "Joe Kennedy for President? Massachusetts congressman says its 'furthest thing from my mind'". The Republican. July 18, 2017. Retrieved August 13, 2017. ↑ Spitalniak, Laura (February 7, 2019). "Rep. Joe Kennedy III rules out 2020 bid, but encourages 'big, broad field'". ABC News. Retrieved February 7, 2019. 1 2 Warren, Elizabeth [@ewarren] (February 9, 2019). ""I am so thrilled to help introduce the next President of the United States – Elizabeth Warren!" –Rep. @JoeKennedy #Warren2020" (Tweet). Retrieved February 9, 2019 – via Twitter. ↑ Morin, Rebecca (November 28, 2018). "John Kerry not ruling out 2020 bid for president". Politico. Retrieved February 10, 2019. ↑ "John Kerry to Trump: Resign". Agence France Presse. January 23, 2019. ↑ Gintautas Dumcius (December 6, 2018). "'I doubt I'll run for office again, I said that very clearly,' John Kerry tells crowd at Edward Kennedy Institute". masslive.com. Retrieved February 15, 2019. ↑ Blow, Charles M. (November 25, 2018). "Will Mitch Run?". The New York Times. Retrieved December 28, 2018. ↑ Grace, Stephanie (November 26, 2018). "Stephanie Grace: As 2020 field starts to develop, Mitch Landrieu waits — and watches". The Advocate (Louisiana). Retrieved December 28, 2018. ↑ Axelrod, Tal (February 6, 2019). "Mitch Landrieu on 2020 run: 'I don't think I'm going to do it'". TheHill. Retrieved February 6, 2019. ↑ Prakash, Nidhi (December 12, 2018). "Sen. Chris Murphy Said He Is "Not Planning" To Run For President, But Wouldn't Explicitly Rule It Out". BuzzFeed News. Retrieved December 29, 2018. ↑ "'This Week' Transcript 12-9-18: Sen. Marco Rubio and Sen. Chris Murphy". ABC News. December 9, 2018. Retrieved December 9, 2018. ↑ Krasselt, Kaitlyn (January 24, 2019). "Murphy '100 percent' not running for president". Connecticut Post. Retrieved January 25, 2019. ↑ Brodesser-Akner, Claude (July 5, 2018). "Is Phil Murphy already running for president? Experts say take a look at the signs". NJ.com. Retrieved July 5, 2018. ↑ Malloy, Daniel (October 30, 2017). "COULD JERSEY'S LIKELY NEXT GOVERNOR BE THE DEMS' GREAT LAST HOPE?". Ozy. Retrieved February 22, 2018. 1 2 Murphy, Phil [@PhilMurphyNJ] (February 1, 2019). "Cory Booker ran toward the toughest problems and has fought to build a more just and fair nation for everyone, from his days on the Newark City Council, as mayor, and as a U.S. Senator. He'll make an amazing President" (Tweet). Retrieved February 1, 2019 – via Twitter. ↑ Boggioni, Tom (March 18, 2017). "'I got a guy': Bill Maher predicts 2020 Democratic presidential candidate if they don't 'f*ck it up'". The Raw Story. Retrieved August 13, 2017. ↑ Wagner, Kurt (November 15, 2016). "Gavin Newsom: 'Being president sounds like the most miserable job in the world'". Recode. Retrieved January 6, 2017. ↑ Debenedetti, Gabriel (October 25, 2018). "Gavin Newsom Has More Important Things to Do Than Run for President". New York. Retrieved October 25, 2018. 1 2 Cadelago, Christopher (February 15, 2019). "Gavin Newsom endorses Kamala Harris for president". Politico. Retrieved February 15, 2019. ↑ Conway, Madeline (January 23, 2017). "For mourning Democrats, Michelle Obama offers hope". Politico. ↑ Earl, Jennifer (November 10, 2016). "Michelle Obama responds to someone asking her to run for president in 2020". CBS News. Retrieved March 15, 2017. ↑ Melissa Quinn (April 3, 2018). "Martin O'Malley keeping an 'open heart and open mind' about running for president in 2020". Washington Examiner. Retrieved January 26, 2019. ↑ @MartinOMalley (January 3, 2019). "I will not be running for President in 2020" (Tweet) – via Twitter. ↑ Michael Levenson (March 6, 2018). "Deval Patrick says a 2020 presidential run is 'on my radar screen'". The Boston Globe. Retrieved January 26, 2019. ↑ Levenson, Michael; McGrane, Victoria (December 5, 2018). "Deval Patrick isn't running for president in 2020, citing 'the cruelty of our elections process'". The Boston Globe. Retrieved December 6, 2018. ↑ Fouriezos, Nick (November 30, 2018). "Is this Blue Apron Investor Aiming for the White House on a Poverty Platform?". OZY. Retrieved January 12, 2019. ↑ Garofoli, Joe (December 14, 2018). "Taking On Trump: Democrats Lining Up Early for 2020". San Francisco Chronicle. Retrieved January 12, 2019. ↑ Sanberg, Joe (February 8, 2019). "I will support whoever is the Democratic nominee for President in 2020!". Twitter. ↑ Levine, Jon (July 24, 2017). "President Scarborough? New Interview Says Joe 'Didn't Rule Out' Interest In White House Run". Mediaite. Retrieved August 21, 2017. ↑ Borchers, Callum (October 3, 2017). "Joe Scarborough isn't running 'for a while,' but here's his gun-control stump speech". The Washington Post. Retrieved October 28, 2017. ↑ Nuzzi, Olivia (July 23, 2017). "Joe Scarborough, Mika Brzezinski, & Trump: A Love Story". New York. Retrieved July 25, 2017. ↑ Alison King; Karla Rendon-Alvarez (February 4, 2019). "U.S. Rep. Adam Schiff Says He's Not Running for President During NH Stop". NECN. Retrieved February 4, 2019. ↑ Schwartz, Brian (November 9, 2018). "Former Starbucks CEO Howard Schultz assembles an elite PR team as he considers running for president". CNBC. Retrieved December 5, 2018. ↑ Allen, Mike (October 2, 2018). "Howard Schultz hits the road". Axios. Retrieved December 5, 2018. ↑ Dovere, Edward-Isaac (January 26, 2019). "Ex–Starbucks CEO Could Get Trump Re-elected". The Atlantic. ↑ Dickinson, Tim (January 9, 2019). "Tom Steyer Ends 2020 Speculation in Iowa". Rolling Stone. Retrieved January 20, 2019. ↑ Re, Gregg (January 9, 2019). "Tom Steyer, billionaire anti-Trump activist, says he won't run for president but vows $40M impeachment push". Fox News. Retrieved January 10, 2019. ↑ Drake, Phil (December 3, 2018). "Tester says he won't run for president". Great Falls Tribune. Retrieved December 6, 2018. ↑ "Killer Mike Likes Oprah Winfrey, But Picks Ohio Politician for President". TMZ. January 12, 2018. Retrieved January 13, 2018. ↑ "An Interview With Nina Turner". Jacobin. ↑ Picket, Kerry (July 20, 2017). "Maxine Waters: I'll Run For President If Millennials Want Me To". The Daily Caller. Retrieved July 21, 2017. ↑ Estepa, Jessica (August 4, 2017). "Rep. Maxine Waters says she isn't running for president". USA Today. Retrieved January 21, 2018. ↑ Oppenheim, Maya (March 3, 2017). "Oprah Winfrey considers 2020 Presidential run in wake of Donald Trump's win". The Independent. Retrieved March 15, 2017. ↑ Marie Segarra, Lisa (January 25, 2018). "Sorry, Oprah Fans. She's Not Running for President in 2020". Time. Retrieved January 25, 2018. ↑ "Oprah Winfrey: I don't want to run for US president". BBC. November 1, 2018. Retrieved November 3, 2018. ↑ Lafrance, Adrienne (January 19, 2017). "Zuckerberg 2020?". The Atlantic. Retrieved March 15, 2017. ↑ Carberry, Maegan (March 12, 2017). "We picked the wrong billionaire: The case for Mark Zuckerberg 2020". Salon. Retrieved March 15, 2017. ↑ Kantrowitz, Alex; Tiku, Nitasha (January 24, 2017). "Mark Zuckerberg says he's not running for president". CNBC. Retrieved January 25, 2017. 1 2 Johnson, Ted (December 20, 2018). "DNC Announces Plan for 12 Presidential Primary Debates; First Slated for June". Variety.com. Retrieved December 20, 2018. ↑ David Siders (February 14, 2019). "DNC announces fundraising, polling thresholds for early debates". Politico. Retrieved February 14, 2019. ↑ "2020 Democratic Debate Schedule (Primary Debates)". Retrieved February 24, 2019. ↑ Fritze, John (July 28, 2017). "Delaney announces campaign for president, becomes first to challenge Trump". The Baltimore Sun. Retrieved December 11, 2018. ↑ Tribune, The Texas; Svitek, Patrick (December 12, 2018). "Julián Castro forms presidential exploratory committee, sets Jan. 12 announcement". The Texas Tribune. Retrieved February 19, 2019. ↑ "APNewsBreak: DNC, TV networks discuss presidential debates". Associated Press. August 25, 2018. ↑ WSAZ News Staff (November 11, 2018). "State Senator Richard Ojeda to run for President in 2020". Huntington, West Virginia: WSAZ-TV. Retrieved December 5, 2018. ↑ Raymond, Adam K. (November 20, 2018). "Richard Ojeda Isn't Like Other Democrats. Is That a Good Thing?". New York. Retrieved February 3, 2019. 1 2 Weber, Paul (December 12, 2018). "Julian Castro Forming Presidential Exploratory Committee". Bloomberg. Retrieved December 12, 2018. ↑ Kelly, Caroline (January 11, 2019). "Tulsi Gabbard says she will run for president in 2020". CNN. Retrieved January 11, 2019. ↑ Goldmacher, Shane (January 15, 2019). "Kirsten Gillibrand, New York Senator, Joins Democratic Race for President" – via NYTimes.com. ↑ Solie, Stacey (January 27, 2019). "Kamala Harris Kicks Off 2020 Campaign with Oakland Rally". The New York Times. ISSN 0362-4331. 1 2 "Tulsi Gabbard launches presidential campaign at Waikiki event". Honolulu Star-Advertiser. February 2, 2019. Retrieved February 3, 2019. ↑ "Elizabeth Warren officially kicks off bid for White House". Associated Press. February 9, 2019. Retrieved February 9, 2019. ↑ "Bernie Sanders Enters 2020 Presidential Campaign, No Longer An Underdog". NPR. February 19, 2019. Retrieved February 19, 2019. 1 2 3 4 5 6 7 8 9 10 11 12 13 14 15 16 17 18 19 Putnam, Josh (January 18, 2019). "The 2020 Presidential Primary Calendar". Frontloading HQ. Retrieved February 23, 2019. ↑ "Exclusive: Democrats, anticipating heated primary, set earlier 2020 convention date". CNN. Retrieved June 15, 2018. ↑ "Houston moves forward with DNC 2020 bid". KHOU. Retrieved June 8, 2018. ↑ "Cruise ship hotels, zoo parties and an NBA arena: Miami's Democratic convention pitch". miamiherald. Retrieved July 1, 2018. ↑ Glauber, Bill; Nelson, James B.; Daykin, Tom (February 21, 2018). "Milwaukee leaders announce bid for 2020 Democratic National Convention". Milwaukee Journal Sentinel. Retrieved February 21, 2018. ↑ "City of Milwaukee 1 of 3 finalists to host 2020 Democratic National Convention". FOX6Now.com. June 20, 2018. Retrieved July 1, 2018. 1 2 3 4 5 6 7 8 9 10 Johnson, Ted (February 20, 2019). "J.J. Abrams, Katie McGrath to Host Fundraiser for Kamala Harris". Variety. Retrieved February 24, 2019. ↑ Menendez, Bob [@BobMenendezNJ] (February 1, 2019). "I can't think of anyone better to represent and unite the American people. Cory makes a great friend, and will make an even greater president. I can't wait to support you on this journey—I'm all in! #Cory2020 - RM" (Tweet). Retrieved February 1, 2019 – via Twitter. 1 2 3 4 5 6 7 8 9 10 11 12 13 14 15 16 17 18 19 20 21 22 Booker, Cory (February 21, 2019). "50+ NJ Democrats Endorse Cory Booker for President". Medium. Retrieved February 21, 2019. ↑ Nielsen, Amy [@RepAmyNielsen] (February 26, 2019). "Now more than ever, we need someone who can deliver a message of optimism and unity. That's why I'm excited to announce my endorsement of @CoryBooker for President of the United States. I hope you will join me. #Cory2020" (Tweet). Retrieved February 26, 2019 – via Twitter. 1 2 McGuinness, Dylan (January 12, 2019). "Castro launches his presidential bid". San Antonio Express-News. Retrieved January 14, 2019. ↑ Carrasquillo, Adrian (June 8, 2018). "JULIÁN CASTRO IS HEADED TO IOWA, BUT HE THINKS THE PATH TO THE WHITE HOUSE RUNS THROUGH THE SOUTHWEST". The Intercept. Retrieved January 28, 2019. ↑ "Watch Live: Julián Castro to make 2020 presidential campaign announcement". NBC News. January 12, 2019. Retrieved January 12, 2019. ↑ @ZachMontellaro (19 February 2019). "Bit of news: You can count #TX32's @ColinAllredTX as officially endorsing @JulianCastro's bid for president" (Tweet) – via Twitter. ↑ DiStaso, John (February 25, 2019). "Julian Castro taps Nashua state Rep. Manny Espitia as NH presidential campaign director". WMUR. Retrieved February 25, 2019. 1 2 3 Svitek, Patrick (January 12, 2019). "Julián Castro's 2020 announcement brightens spotlight on potential Texas showdown with Beto O'Rourke". Retrieved January 13, 2019. ↑ Nowlin, Sanford (January 12, 2019). "Former San Antonio Mayor Julián Castro Launches 2020 Presidential Bid at West Side Rally". San Antonio Current. Retrieved January 12, 2019. ↑ Alonzo, Cristela [@cristela9] (January 12, 2019). "They're playing #Selena at the end of @JulianCastro's announcement for presidential bid!! All they need now is the old Mexican couple dancing on the floor that won't sit down and tamales. He even said, "Vamonos!" like Johnny Canales. THIS IS MY KIND OF ANNOUNCEMENT!✊🏾 #Julian2020" (Tweet). Retrieved January 14, 2019 – via Twitter. ↑ Merica, Dan (January 12, 2019). "Julián Castro officially announces 2020 presidential bid". CNN. Retrieved January 14, 2019. ↑ Zients, Jeff (September 5, 2017). "SCHEDULE A-P ITEMIZED RECEIPTS". Federal Election Commission. Retrieved February 28, 2018. ↑ Clarke, Victoria (September 19, 2017). "SCHEDULE A-P ITEMIZED RECEIPTS". Federal Election Commission. Retrieved March 3, 2018. ↑ Ashford, Brad [@BradAshford18] (December 10, 2018). "Could John Delaney Beat Donald Trump in 2020? - The Atlantic. John is the only candidate who is focused on bipartisan solutions. That is what we desperately need" (Tweet). Retrieved December 13, 2018 – via Twitter. ↑ Hanna, Richard (July 31, 2017). "SCHEDULE A-P ITEMIZED RECEIPTS". Federal Election Commission. Retrieved March 2, 2018. ↑ McMillen, C. Thomas Thomas (September 22, 2017). "SCHEDULE A-P ITEMIZED RECEIPTS". Federal Election Commission. Retrieved March 2, 2018. 1 2 Case, Jean; Case, Steve (September 25, 2017). "SCHEDULE A-P ITEMIZED RECEIPTS". Federal Election Commission. Retrieved March 3, 2018. ↑ Fisher, John J. (June 26, 2017). "SCHEDULE A (FEC Form 3) ITEMIZED RECEIPTS". Federal Election Commission. Retrieved February 28, 2018. ↑ Mandel Jr., Stephen (August 1, 2017). "SCHEDULE A-P ITEMIZED RECEIPTS". Federal Election Commission. Retrieved March 2, 2018. ↑ "SCHEDULE A (FEC Form 3) ITEMIZED RECEIPTS". April 27, 2017. ↑ Tagliabue, Paul (September 27, 2017). "SCHEDULE A-P ITEMIZED RECEIPTS". Federal Election Commission. Retrieved March 1, 2018. ↑ Paparian, Bill (February 16, 2019). "Tulsi Gabbard could be the president America needs". Pasadena Star-News. Retrieved February 18, 2019. ↑ Swoyer, Alex. "David Duke endorses Tulsi Gabbard 2020 presidential campaign". The Washington Times. The Washington Times. Retrieved 26 February 2019. ↑ Steinbuch, Yaron (5 February 2019). "Rep. Tulsi Gabbard gets 2020 endorsement from David Duke". New York Post. Retrieved 26 February 2019. ↑ Axelrod, Tal (5 February 2019). "Tulsi Gabbard denounces David Duke, rejects his endorsement". TheHill. Retrieved 26 February 2019. ↑ Canova, Tim [@Tim_Canova] (January 26, 2019). "I was just asked by a reporter if I think @BernieSanders will run again for President in 2020, would I support him if he does, and will he fight the kinds of election rigging that killed his last campaign. Let me be clear, I don't know anything about Bernie Sanders. #Tulsi2020" (Tweet). Retrieved January 27, 2019 – via Twitter. ↑ "Tulsi Gabbard kicks off 2020 campaign". NBC News. February 2, 2019. Retrieved February 3, 2019. ↑ Watson, Paul [@CaptPaulWatson] (February 17, 2019). "TULSI 2020 I drove to Keene, New Hampshire today to attend a rally for Tulsi Gabbard for President. I was impressed. She's the first politician running for President who straight forwardly… www.instagram.com/p/Bt-NP8fHo_c/" (Tweet). Retrieved February 18, 2019 – via Twitter. 1 2 3 4 Cadelago, Christopher (January 21, 2019). "Kamala Harris launches campaign for president". Politico. Retrieved January 22, 2019. ↑ Henderson, Nia-Malika (February 14, 2019). "Harris scores big CBC endorsement in Barbara Lee". CNN. Retrieved February 14, 2019. ↑ Hill, Katie [@KatieHill4CA] (January 29, 2019). "Proud to announce my full support of @KamalaHarris for President. She has the vision, strength and values to move our nation forward and I look forward to continuing our work together to put the American people first. 🇺🇸 #ForThePeople" (Tweet). Retrieved January 30, 2019 – via Twitter. ↑ Lieu, Ted [@tedlieu] (January 28, 2019). "I endorse @KamalaHarris for President. Known Kamala for many years & worked together on various issues. She embraces the future, not the past, and is the person we need to move America forward. Watch the #HarrisTownHall tonight at 7 pm PT / 10 pm ET to learn more about Kamala" (Tweet). Retrieved January 28, 2019 – via Twitter.